Sukanya enjoys hiking, rock climbing and ice skating. She was selected to go to Panama this summer with her school’s ecology club to learn more about the rain forest. A pianist, Sukanya also plays violin in her school’s orchestra. She won first place in the individual portion of the Northeast Pennsylvania Chapter Mathcounts Competition. Last summer, she was selected to participate in Jeopardy! Kids Week at the regional level. Sukanya speaks Bengali, and every summer travels to India to visit family. She hopes to pursue a career in international relations. 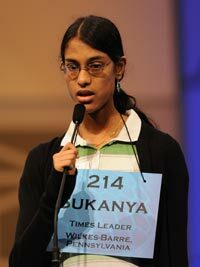 Sukanya participated in the 2009 and 2010 Scripps National Spelling Bees, tying for 12th place in 2009 and 20th place in 2010. Laura loves writing, especially short stories, and aspires to be a writer. She also likes singing, dancing, drawing, reading and origami. She recently began taking swim classes because it is one of her favorite pastimes, and she is learning Mandarin and French. Laura frequently volunteers with her school’s charitable organization. Her favorite book is The Host by Stephenie Meyer, and she is an avid fan of anything Japanese, especially manga. Laura tied for 17th place in the 2009 Scripps National Spelling Bee and tied for 5th place in the 2010 Scripps National Spelling Bee. Her sister Leslie participated in the 2006 Scripps National Spelling Bee. Arvind’s favorite school subject is math, and he aspires to be a physicist like his role model, Albert Einstein. Outside of school, Arvind enjoys playing tennis and soccer, reading books and acting. He also enjoys Indian classical music and speaks Telugu. Not one to be shy, Arvind once delivered a monologue performance in front of an audience of 7,000. In 2009 he was a university talent search participant. 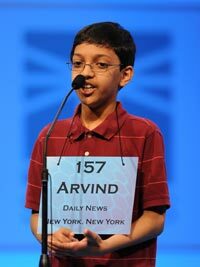 Arvind tied for 9th place in the 2010 Scripps National Spelling Bee. His cousin Sanjay Kottapali participated in the 2008 and 2009 Scripps National Spelling Bees. Joanna enjoys playing tennis and is team manager for a high school girls’ tennis team. She likes to listen to music and is a member of the Wednesday Club, which is a classical music society. Joanna plays flute in her school’s concert band and alto saxophone in her school’s jazz band and a district honor band. She won first place for her fiction writing in the Hershey Story Historical Writing Contest. Joanna tied for 5th place in the 2010 Scripps National Spelling Bee and upon returning to her hometown of Carlisle, Pennsylvania, was honored with “Joanna Ye Day” on June 11, 2010. Dakota attends a magnet school that specializes in mathematics and science educations. He won third place in the 2010 state-level Mathcounts competition, second place in the 2011 Mathcounts chapter countdown round, and second place in the 2011 Mathcounts chapter overall competition. Dakota plays the viola and is also involved in Boy Scouts, where he has earned the rank of Life Scout. In his free time, Dakota enjoys playing chess, reading and camping. 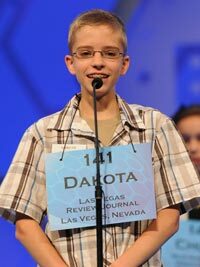 Dakota tied for 33rd place in the 2010 Scripps National Spelling Bee. Veronica is a leading air cadet for the 832 Ottawa Twillick Air Cadet Squadron and often participates in parades, gliding and similar activities with the group. She is an avid newspaper reader and enjoys her job of delivering them once a week. In her free time, Veronica enjoys outdoor activities—gardening, swimming, camping, bike riding and geocaching. She also likes to shop and bake. Veronica has earned three Earth Day awards—two bronze and one silver—and has won a Jelly Bean guessing contest twice. 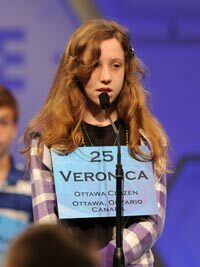 Veronica participated in the 2008 and 2009 Scripps National Spelling Bees. Dhivya was born in India and speaks Tamil in her home. She is learning Spanish and has regular exposure to Hindi as well. 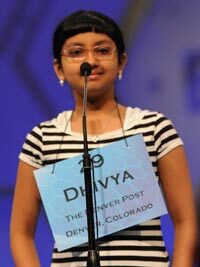 Dhivya participates in her school chess club, math club and Destination Imagination program. In her free time, she enjoys volunteering at a retirement home, doing arts and crafts, drawing, swimming, roller skating and reading. She especially enjoys reading the Harry Potter series. Dhivya is currently taking piano, karate and Indian classical dance lessons. Sriram enjoys playing oboe and has learned to play several Sanskrit hymns on piano. He spends much of his time participating in sports including skiing, ice-skating, swimming, baseball, basketball, tennis and Ping-Pong. He is an avid reader and especially enjoys the Harry Potter book series. Sriram’s favorite school subject is science and he hopes to become an ophthalmologist. He participated in the 2008 and 2009 Scripps National Spelling Bees. A true competitor, Mashad participates in spelling, writing, math and poetry recitation competitions through the University Interscholastic League. He is also a member of his school’s robotics team. Mashad’s Science Bowl team placed fourth at the Rio Grande Valley Regional competition after building and racing a hydrogen fuel cell car. He enjoys playing badminton and piano and is a member of the school’s cross-country team. Mashad admires the art and architecture of Frank Lloyd Wright and his career aspirations include architecture, engineering, journalism or international relations. 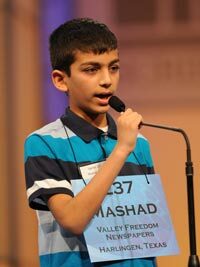 Mashad participated in the 2010 Scripps National Spelling Bee. Lily loves playing softball and has been working to learn how to throw a knuckleball. She also plays field hockey and ice hockey, where she plays goalie, and enjoys skiing and snowboarding in her free time. Lily participates in Girl Scouts and is a member of her school honors band and debate team. She enjoys writing and earned a Scholastic Writing award as well as second place in an essay contest about Native American culture. Lily enjoys learning about and following politics, studying French, reading, and photography. 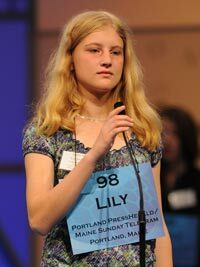 She participated in the 2010 Scripps National Spelling Bee. Nabeel has been playing viola for a few years and is a member of his school’s orchestra. He enjoys competing in intramural sports including soccer, track and field, and basketball. Nabeel’s favorite subject is math and he is a Math Olympiad participant. He is an active volunteer and helps with his school’s food drive and is his homeroom representative for the student activities committee. Nabeel speaks Bengali and loves to travel. In his free time, he enjoys riding his bike and solving Rubik’s Cube, which he can do in a few minutes. 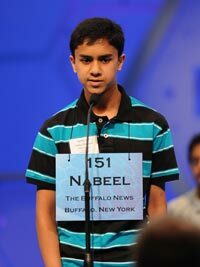 Nabeel participated in the 2010 Scripps National Spelling Bee. Prakash has written several novels and enjoys reading, especially works by Shakespeare, Edgar Allan Poe and T.S. Eliot. Prakash speaks five languages, including Hindi, French, German, Spanish and English. He is passionate about academics and especially enjoys learning about history, culture and religion. Prakash studies Tae Kwon Do, plays both piano and drums, and loves to play hacky sack. He is a Junior Beta Club member and the Mega Math Madness first place champion. 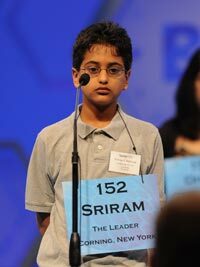 Prakash participated in the 2010 Scripps National Spelling Bee. Samuel likes to spend time outdoors with his six siblings. He enjoys playing games on the Wii and the computer. Samuel aspires to become a computer scientist and is already honing his programming skills by making games on his calculator. To date he has made a car racing game, a snake game and is working on a chess game. Samuel’s dream is to design a working portal gun and a computer that understands English. His family has a solar array on their roof that provides most of the electricity for their house. 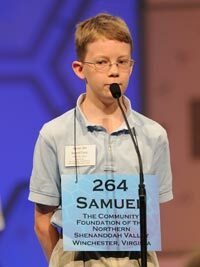 Samuel participated in the 2010 Scripps National Spelling Bee. His sister, Marissa Estep, participated in the 2004 and 2006 Scripps National Spelling Bees.